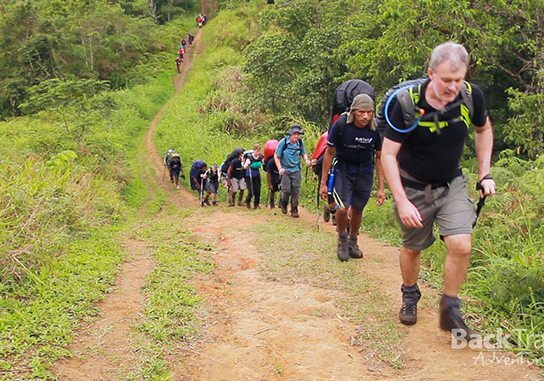 In July, I led a trekking group over the Kokoda Track. We travelled South to North and as usual, we had a great experience. July is typically the cooler, dry season and the first half of the trek was exactly that. The second half though, was the exact opposite with heavy rain every day. 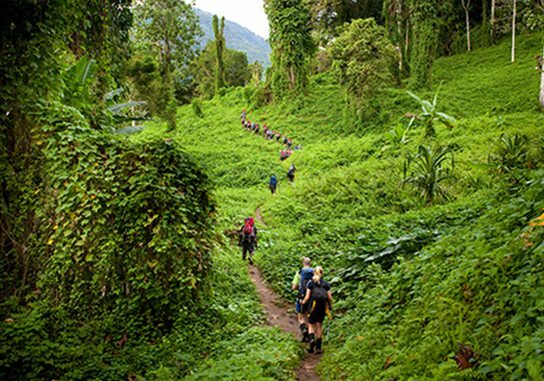 That’s one of the great, adventurous aspects of Kokoda – expect the unexpected. So, what are the differences in trekking the Kokoda Track in both wet and dry conditions? Following lengthy, but rare, dry periods you may encounter dust on the Kokoda Track. Thankfully, it won’t be enough to have any noticeable effect. Less rain means low water levels in the rivers and creeks. You may need to only remove your boots when crossing the Goldie and Brown Rivers and Ofi Creek. The crossings of Vua Ale Creek may be achieved without removing boots provided you’re surefooted enough to negotiate slippery rocks. Your personal porter can also assist you. Trekkers tend to spend less time walking on a dry track because, underfoot, the going is easier. It’s less slippery and there’s less muddy patches and pooled water to walk around. Keeping dry means you spend less time drying your stuff. A dry tent means that you and your stuff stays dry while you’re in there. 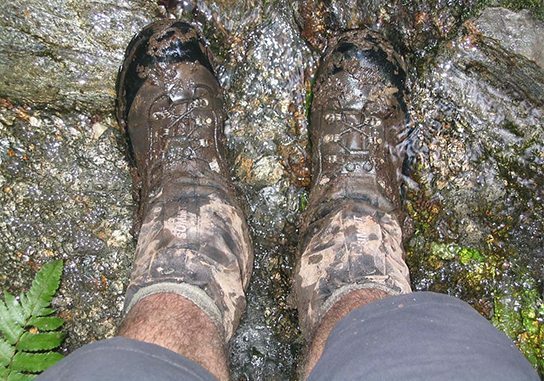 Dry boots and socks means dry feet and dry feet means you’re less likely to get blisters and crumpet foot (also known as trench foot). Much of the Kokoda Track is spent trekking in the shade of the jungle canopy but when you’re out in the open on a cloudless day, the heat and glare of the sun can be fierce and debilitating. During wet periods, the rain falls over the high ridges and runs down into river valleys. The already fast running creeks and rivers become swollen and massive torrents of water wash away bridges and flow well over rocks placed there to aid trekkers to cross. So, it’s boots off, sandals on. If necessary, our trek crew will fix a rope across the creek to assist us. When, with every step your foot sinks into mud, your foot also needs to be extracted. This takes longer and over the course of a day this may result in trekking an extra hour or more. Downhill sections become increasingly hazardous because the normally hard packed earth becomes a slick and greasy surface. Intense concentration and a slower pace is required to avoid slipping. Sometimes heavy and thick, sometimes wet and oozing; trekking through the mud is an all too familiar aspect of the Kokoda Track. After and during rain, the Track presents a challenge when water hits the ground. Sustained rain gets things wet; your pack, your clothes and your tent. Everything you touch is wet. Inside your tent, wet things touch dry things and wet always wins. Take ‘dry-bags’, plastic bags and zip-lock bags and minimise the hassle. Happily, water inside a tent won’t hurt you but merely provide a natural Kokoda experience. Most campsite surfaces are thick, spongy lawn. Great for comfort… and for retaining water. The camps aren’t necessarily designed to allow water run-off and constant feet traffic can turn the nice lawn into sloppy mud. Spare a thought for the Diggers who had to spend long periods in an open fox hole, half filled with muddy water. If it rains most days on Kokoda, it’s very difficult to completely dry your boots. At night, remove the inner soles, loosen the laces and open the boot to allow air to circulate. Don’t place your wet boots too close to a fire! Doing this may destroy the glue that adheres the sole to the boot. If this happens, having a wet boot is the least of your troubles. Take three pairs of socks to ensure you’ll always have a dry pair. Wet clothes aren’t as much a concern as wet boots. Synthetic materials dry quickly with body heat and unlike cotton garments, don’t feel cold against the skin when wet. Chaffing can be a problem but this can be overcome with an anti-chaffing solution. When it rains on the Kokoda Track, the temperature may still be warm enough to trek without rain protection; thanks to the tropical climate, you may be wet but stay warm. Only at the highest altitude, where the air is cooler, would you feel the need to cover up. During the height of the Kokoda Campaign during the month of August 1942, the Diggers endured the wettest conditions on the Track in the 40 years since weather records had been compiled. Walking in muddy conditions gives trekkers a greater understanding and appreciation of conditions during the campaign. 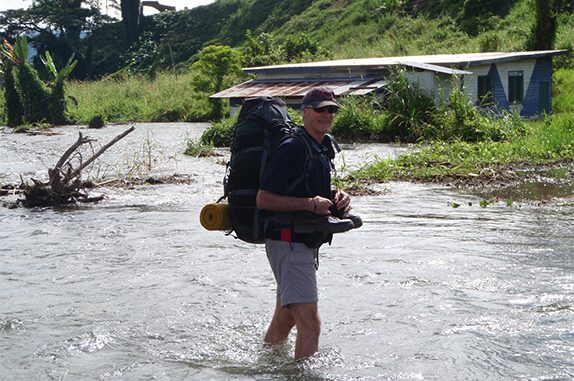 Wet, dry, mud, dust… it’s all part of the great Kokoda adventure. Sure, mud walking can be a chore but the fitter you are the more you’ll enjoy whatever the Kokoda Track dishes up to you. Ps: You can leave your umbrella a home; the jungle foliage along narrow sections of the Track with shred the fabric. Are you ready to trek with us?  Ray Baker is an experienced trek leader who has for decades conquered and led treks on the Kokoka Track, in Nepal and India. He is a qualified fitness trainer and a Director at Back Track Adventures. Find out more about trekking Kokoda – here, or catch Ray’s other two new high altitude adventures taking place in 2018 by clicking on the links – Sikkim and Manaslu.